Keith Giffen, J.M. 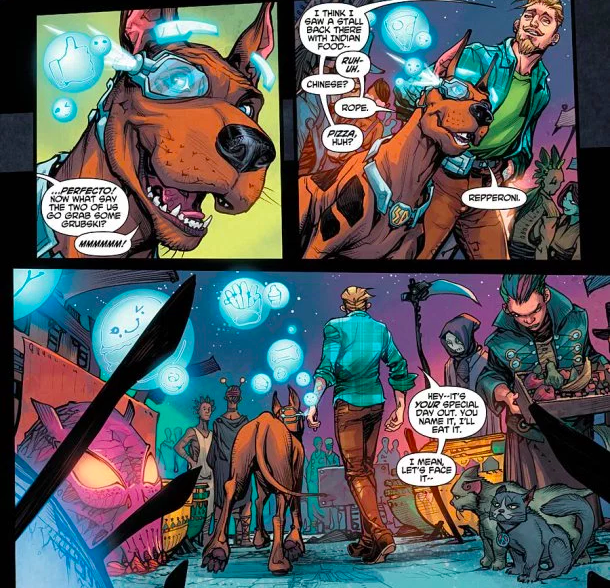 DeMatteis, and Howard Porter reimagine Scooby Doo and the rest of the Scooby gang as a small thrown-together group who have to band together to fight some kind of man-made viral apocalypse that turns humanity into vampires, werewolves and other kinds of monsters. After decades of cartoons that depicted these kids as supernatural sleuths, DC Comics new series turns them into survivalists and warriors. 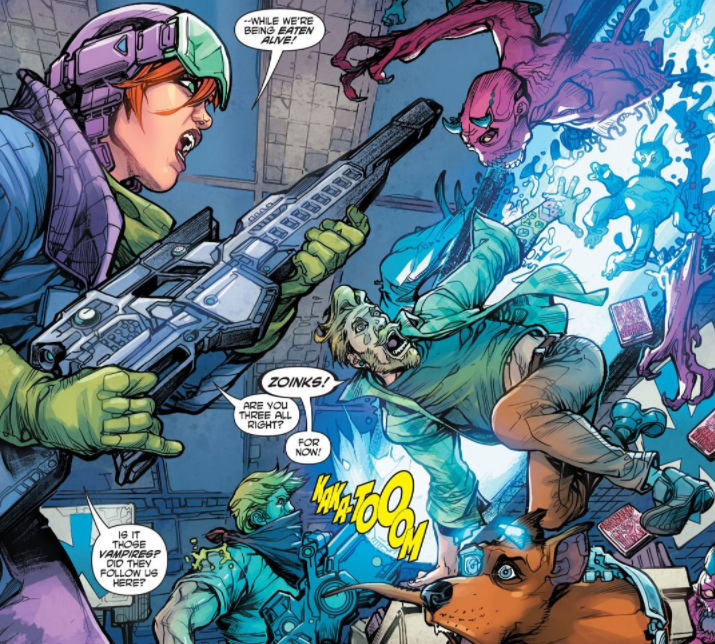 A strange mishmash of The Walking Dead and Afterlife with Archie, Scooby Apocalypse does what DC is doing lately with so many characters-- reimagining characters that are 40 years old and more for a 21st-century audience. And this reimagining fits in well in a time when every day seems to be bringing on a new apocalypse. When did Howard Porter turn into some strange amalgamation of himself, Jim Lee and J. Scott Campbell? The 1990’s artistic influence in this book makes Porter look like a really good Wildstorm artist, taking the visual cues from Lee (who it looks like did some character designs and a number of covers for this series) but adding some incredibly strong storytelling that was missing in those old Image-era comics. Porter, occasional fill-in artist Dale Eaglesham and coloring studio Hi-Fi turn Giffen and DeMatteis’s somewhat standard zombie apocalypse story into an exciting book where you want to see what’s next. It seems that part of updating these characters for a modern artist is turning them into a bunch of stuck up and privileged kids. At least, that’s how the writing portrays this group but Porter keeps his depictions a bit more traditional. There are some more modern touches in these designs-- Freddie’s ascot becomes a bandana and Scooby gets a set of hologram projecting eyewear (??) -- but Porter generally keeps the classic spirit of these characters intact. But he gets the chaotic nature of these characters' lives. Nearly every page is a modern reinterpretation of the scenes from the old cartoons where all of the characters are running around, trying to find and/or escape from the bad guys. As the world is taken over by these creeps and ghouls, Porter keeps the chaos of everything at the forefront of this world as these characters are trying to figure out what’s happening. Using the Scooby gang gives Giffen, DeMatteis, and Porter a prepared template. There’s the brainy one, the jock, the dopey one, the pretty one and the dog. That’s the tried and tested form of these characters and other than giving Daphne (the pretty one in the old stories) a bit more agency by making her the pretty but tough one, they stick to playing the classics with these characters. You can take a look at what Roberto Aguirre-Sacasa is doing over in books like Afterlife With Archie and Sabrina and view that as the model that DC is following of taking these characters and twisting their world just enough to make something new. Aguirre-Sacasa uses the well-known Archie characters to subvert their wholesomeness. Those Archie comics use their time-worn templates but reposition them one one level as zombie and witchcraft stories but on another level as stories about kids rather than just stories about kids in the 1950s. Giffen, DeMatteis, and Porter are not nearly that daring with this group. Even in the after-school-special chapter looking at Velma’s (the smart one) relationship with her family and with everything that’s going on, there’s nothing in these characters that make them relatable like Aguirre-Sacasa or even Mark Waid’s work with the Archie characters. As the Scooby kids fulfill their preset roles in this comic, Scooby Apocalypse comes across more as just another Scooby Doo story, with characters who aren’t able to grow beyond their decade's old default character values. Daphne is the most evolved and different from what she was and that’s cynical because you can’t just have a character whose only purpose today is to be the pretty one. Even if the characters aren’t all that great (were they ever?,) Giffen, DeMatteis, and Porter are clearly having fun with this book and it’s infectious. The way that they play with the old elements of the cartoons, the mysteries, and the characters is the fuel of this story. 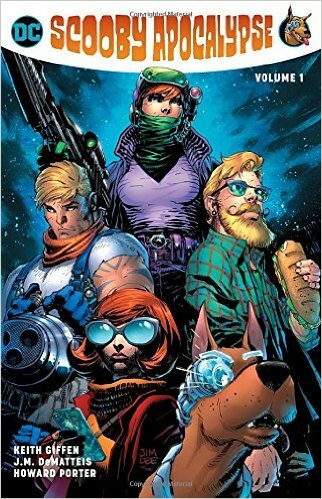 From the monsters to even Scrappy Doo, no longer Scooby’s nephew but something far darker and sinister, this creative team write and draw a highly entertaining comic. Giffen and DeMatteis have always had a good handle on casts and groups of characters and by throwing these kids together, they bounce these characters off one another in this crazy, end-of-the-world scenario. And Porter artwork has an animated energy to it that propels you through the book.